Tag&Rename provides full support for the following tag frames in all supported music formats: Artist, Album, Title, Year, Genre, Comment, Composer, Original Artist, Copyright, URL, Encoded by, Track #, Disc #, Rating, Mood, BPM, Part of a compilation, Cover art, Lyrics, Album Artist, Conductor, Lyricist, Original Lyricist, Label, Remixed by, Radio station name, Audio file information web page, Artist web page, Audio source web page, Radio station web page, Buy CD web page, ISRC #, Catalog #. 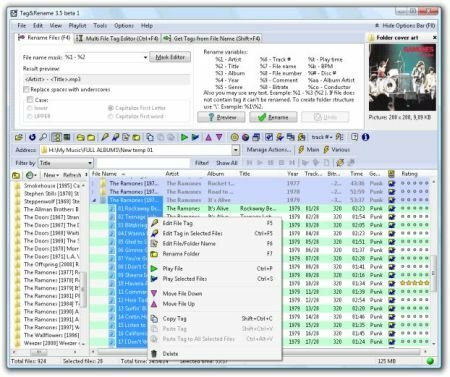 Music files tag editor that easily handles all popular digital audio formats. No matter what music compressor you prefer, you can keep your music collection organized with Tag&Rename. Tag&Rename include full Unicode support. Supports many additional tag fields including lyrics, cover art, rating, mood, disc #, part of a compilation, album artist, classical music fields (Composer, Conductor, etc. ), file related URL's and so on.